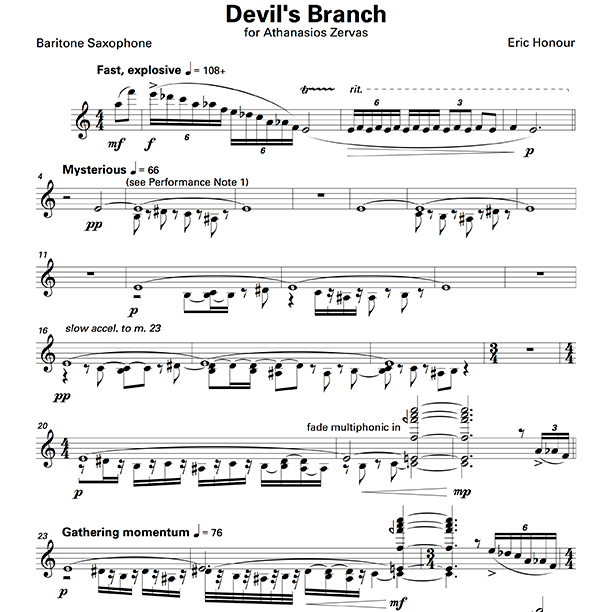 Devil’s Branch for solo baritone saxophone. “Devil’s Branch” is the name of a small stream near the town where I work. Each day, when I drive to work, I cross a bridge over Devil’s Branch just before I exit the highway and enter the town. In some ways, it reminds me of Orpheus crossing the river Styx to enter the realm of Hades. The music in Devil’s Branch plays off this trope, beginning mysteriously and then spinning beyond control into a furious roar before fading away. Recorded in Athens, Greece on July 7, 2015.